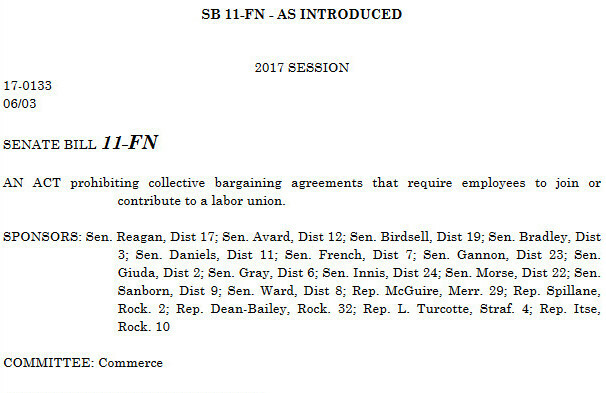 The New Hampshire Senate will be holding a hearing on so called "Right to Work' on Tuesday, January 10, at 1:00 PM at Representatives Hall at the State House in Concord. We need you to show up and bring a friend with you, if you can. We all know that "Right to Work" is the preferred method to destroy unions in this country. This is wrong for businesses and wrong for New Hampshire workers and their families. The Senate is trying to ram this bill through which explains the short notice and lack of fanfare or advertising about it. They believe with short notice, they will not get many people to the hearing and thus not hear the will of New Hampshire workers. Even if you can only come to the State House for a few minutes, your voice could make a difference. Please attend in person, sign in, in opposition of Senate Bill 11-FN. If you cannot attend, please write your senator, representatives, executive council member, and the Governor, and let them know that you do not support "Right to Work" legislation, as it only destroys workers' rights and favors opposition of Corporate bosses. These kinds of bills are drafted by the American Legislative Exchange Council (ALEC), an organization funded by the Koch Brothers. 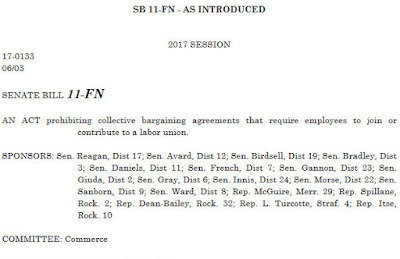 This bill prohibits collective bargaining agreements that require employees to join or contribute to a labor union. Note: the Calendar on the Senate Calendar Page (http://www.gencourt.state.nh.us/Senate/calendars_journals/default.html) is labelled "No.05, January 05, 2016". It could be a mistake, or it could be a ploy to trick folks into thinking it was last year's calendar.